The Disney Social Media Moms Celebration was filled with memorable moments. During one of these, a speaker asked if anyone wasn’t on Pinterest. I tentatively raised my hand, but could see nobody else doing the same. Was I the only one who wasn’t yet on Pinterest? Or were the other people just not brave enough to admit it? The thing is, Pinterest just doesn’t interest me. Neither does Facebook, which I’m also not on. I used to use Google+, but have even scaled that back to the point that I haven’t checked in there in about a month. There are a ton of social media platforms out there, but I’m not on a lot of them. Why? Simple. I just don’t have the time. Given my limited "social media time", I feel I have two options. I can use Facebook, Pinterest, Google+, Twitter, etc. However, if I split my time in so many directions, I’ll likely be unable to use any of them effectively. In fact, I’d likely get burned out from trying to keep up with it all and would begin to neglect other responsibilities. Alternatively, I can ignore many popular social media networks and focus my efforts on the ones that suit me best. In this case: Blogging and Twitter. 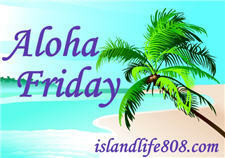 My Aloha Friday question for today is: How many social media networks do you use? I’m the person who signs up for these things and then forgets about them or the passwords/sign ins to get in. There is just so much. Harriet recently posted..what commercial is ‘bugging the tar’ out of you? I have a twitter, but hardly use it. I prefer more interactive social media. I use facebook a lot, and G+ occasionally. I’m on pinterest but dont really enjoy it as much as most of the world does. I’m on FB, and use it too much, if you want to know the truth. I have Twitter and Pinterest accounts, but use them rarely. Haven’t tried Instagram yet.